The Fella has always been saying how he doesn’t have a drink, you know some guys like a particular whisky or whatever. Well the The Fella didn’t, beer was the liquid refreshment of choice. Lucky for him, there are no end to micro breweries in the inner west of Sydney. And believe me, we have done most of them. And then he discovered a liking for my favourite spirit, Gin. Mother’s Ruin to some, tipple of choice for me. And now him too. Friends had told us about the local distillery called Archie Rose. And I had been meaning to try if for awhile, however not knowing that the did sell other beverages I was a bot reluctant to go with someone who did not having a liking for Gin as I did. Not a concern now. So last Sunday we took ourselves of for a visit to Archie Rose. 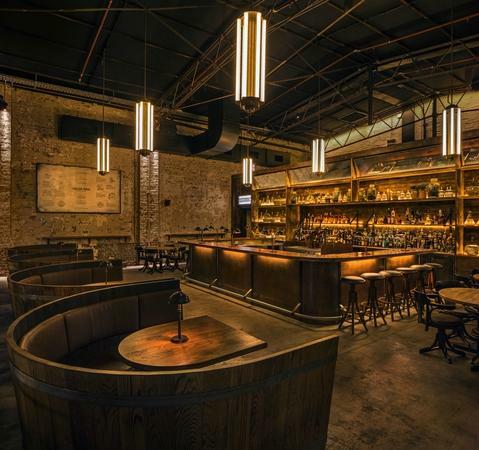 Located within a newish refurb of a disused industrial complex in Rosebery, called The Cannery, it is neighbours with eateries, a brewery, speciality food providores and some homewares stores. Sydney is becoming really good at developing, repurposing and maintaining these old buildings, especially around its once bustling industrial areas. The Harold Park Tramsheds in Forest Lodge is another that springs to mind. Once a disused, as the name suggests, tram-shed full of old trams covered in graffiti, it is now a large open space split into small eateries (all cuisines) a supermarket, gym, an excellent bottle shop and brewery. Anyway back to Archie Rose. The interior is grown up and dark, but not too dark that you are tripping over. But for a large space it feels intimate and cosy. I immediately loved it. If you were on a first date this would be the place to go to impress. There is a mezzanine level for larger groups. It also has an amazing cabinet of old bottles, (Still full and lock up, of course!!). Now they don’t just do gin, they also distill vodka, whisky and rum. Tours are available, which I will definitely be back for. They offer two gins, I preferred the Distiller’s Strength, the flavour of the botanicals in this were much more defined. And mixed with fresh pineapple juice, it made for a refreshing summer sipper. Distiller Strength Gin and tonic – Archie Rose Distillery. They offer amazing platters of food, curtesy of their neighbours Black Star Pastry. These were large and great value. I am loving how my city is shaping up, these repurposed buildings housing great eateries and drinking establishments is really giving Sydney a unique identity. I hope it just keeps growing. ‹ PreviousWallpaper – I’ve got you covered.